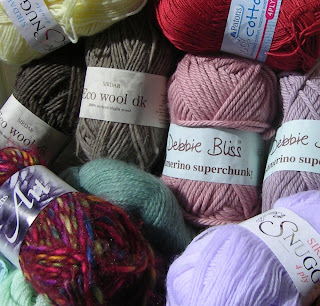 A pic of my yarn stash, just for fun. These are the good (expensive) yarns, mostly - what you can't see much of is the 9l Really Useful Box underneath filled with all sorts of random bits and pieces of mostly unnameable ball ends. You can see the Eco Wool, the red cotton and the mad garnet stuff I bought yesterday as well as some of the Cashmerino heap!